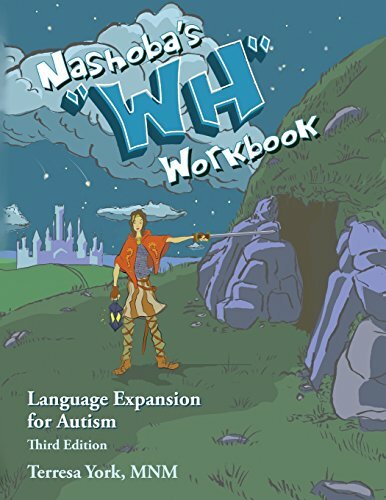 The Nashoba's "WH" workbook - third edition - is designed to gradually increase a child's ability to answer "WH" questions through practice and repetition by utilizing simple, visual, and concrete formats. Color cues and prompts are embedded throughout the workbook to assist the child in formulating questions and answers, and visual cues are gradually faded out as the lessons progress. This workbook utilizes proven educational techniques for children on the Autism Spectrum, and it is appropriate for classroom, individual, or home use. It presents... A concrete, visual approach to expanding language A practical format to reinforce writing skills (although a scribe may be substituted) Multiple structured exercises for repetition and practice Suggested activities to support continued learning and broader generalization Data collection tables for ease of transfer and communication between teachers and environments This workbook has been used by speech therapists, special education teachers, TA's, and parents. It is appropriate for... Kids on the Autism Spectrum Children who prefer visual or concrete learning concepts Students who benefit from structured learning This is the third edition, released in 2016. It is part of the Nashoba's Learning Series, which includes a companion "WH" board game. If you have any questions about this product by Nakia Enterprises, LLC, contact us by completing and submitting the form below. If you are looking for a specif part number, please include it with your message. By Feit, Debbie/ Feldman, Heidi M., M.D., Ph.D.